This piece of stitching should hold your interest all the way through, once one stripe is finished the next is completely different. The tetrahedron shape is simply made from a single oblong and then I have added a handle on the top decorated with hand-made Dorset buttons. This kit contains everything you need to make your doorstop except some silver sand or play sand for filling, you will need about 1.8 kilos (available from your garden centre or DIY shop.). Worked from a coloured chart on size 14 canvas using Appletons crewel wools. 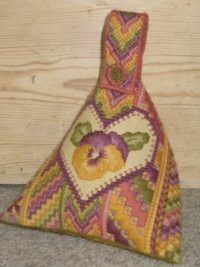 View basket “Pansy Doorstop” has been added to your basket.